Click here to watch our Business Webinar! 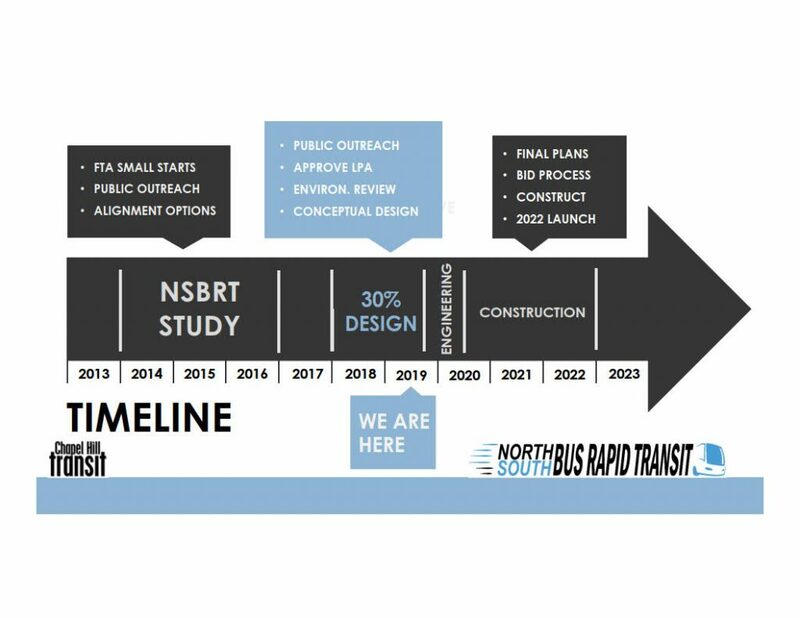 What is the North-South BRT Project? The Town of Chapel Hill’s North-South Bus Rapid Transit is the planned 8.2-mile line along one of the town’s busiest and most vital thoroughfares stretching from Eubanks Road in the north to the popular Southern Village in the south. As the region’s first BRT system, N-S BRT will connect employees, students, residents and visitors to their regional connections and local destinations project history. BRT combines high-capacity buses with exclusive traffic lanes and traffic signal priority to decrease travel times and improve the rider experience. BRT is efficient and enhances transit service by providing more frequent buses, shorter travel times and more reliable service. CAN WE TALK? Chapel Hill Transit staff are reaching out to area residents about the N-S BRT. If you would like an opportunity to hear about the project, contact us. Community Open Houses – click here! BRT Only Lanes separate buses from cars, allowing for faster, more efficient transportation for everyone. Traffic Signal Priority systems hold green lights longer for approaching BRT vehicles. High Capacity, Specialized Vehicles accommodate more riders than traditional buses and feature amenities such as onboard wireless internet and more comfortable seating than traditional buses. State-of-the-Art Transit Stations provide more amenities for transit riders including covered seating, improved pedestrian crossings and cyclist access and real-time schedule information. Improved Air Quality reduces traffic on roadways and mitigates air pollution. How are cities and towns across the country using BRT to improve transit service, ease congestion and address environmental concerns? Below is a short list of smaller U.S. cities that have launched BRT to improve transit in their communities.